US Defense Secretary James Mattis said on Tuesday that the United States will continue "a steady drumbeat" of naval exercises to challenge China's territorial claims in the South China Sea, amid Beijing's militarization of the contested waters. Mattis' comments came after Beijing expressed "firm opposition" on Sunday after two US warships sailed within 12 nautical miles of four artificial islands claimed by China in the disputed Paracel island chain, east of Vietnam. Speaking to reporters during a flight to Hawaii, Mattis said the South China Sea was international waters and "a lot of nations" wanted to see freedom of navigation maintained in the area. "There's a very steady drumbeat of freedom of navigation operations ... You'll notice there is only one country that seems to take active steps to rebuff them or state their resentment of them," he said. The Chinese government, which claims much of the South China Sea as its sovereign territory, has established a significant military presence in the region, installing radar facilities and airstrips on contested islands and reefs. Mattis said Chinese President Xi Jinping had broken the promise he made at the White House in 2015 in regards to his country's actions in the region. "He stated that they would not be militarizing the islands, we have seen in the last month they have done exactly that, moving weaponry in that was never there before," Mattis said. 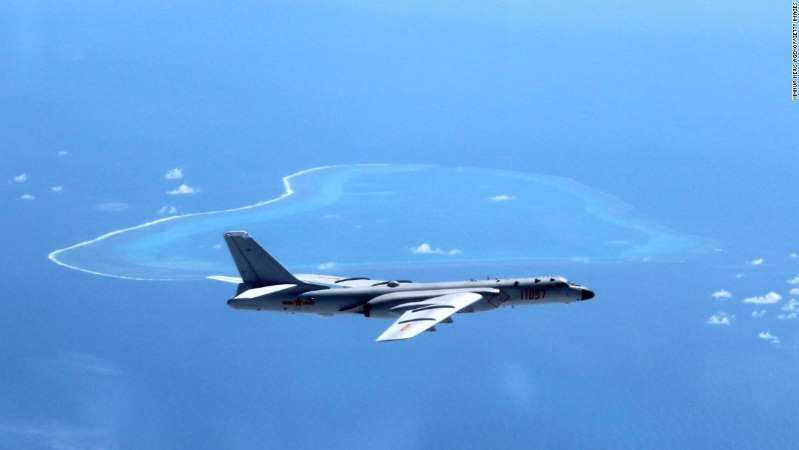 In May, the Chinese military landed nuclear-capable bombers on their artificial islands for the first time. Weeks earlier, US intelligence announced there was a high possibility Beijing had deployed anti-ship and anti-aircraft missiles as part of military exercises. Though the US' latest freedom of navigation operation was likely planned months in advance, experts said it was suggestive of the US' attempts to pursue a harder line against China in the South China Sea. On Sunday, China's Defense Ministry spokesman Wu Qian labeled the return of US warships a "provocation" which violated Chinese and international laws and blamed the US military's exercises for the growing militarization of the region. Mattis, who travels to the annual Shangri-La defense summit in Singapore on June 1, said the United States worked to keep their military activity in the Pacific "very transparent" and expected the same from its partners and allies. "So, when (Beijing) do things that are opaque to the rest of us, then we cannot cooperate in areas that we would otherwise cooperate in," he said. The massive military event, known as RIMPAC, is described by the US Navy as the world's largest international maritime warfare exercise and involves more than 20 countries from across the world. Chinese Foreign Minister Wang Yi said at the time the US decision was "very unconstructive." "It's unhelpful to mutual understanding between China and the US. We hope the US will change such a negative mindset," he told reporters in Washington.